I want to avoid awarding any kind of "Best Sound of Show" prize for this year's AXPONA show in Atlanta since there were so many great exhibits, but the most surprising sound I heard was from the Channel D room, which included the Joseph Audio Pulsar speakers. I reported on Jeff Joseph's new Perspective speakers back in January when he showed them at CES, and I felt they produced an excellent all-around sound. Well, the Perspectives won't be released into the high-end audio market until early this summer (Jeff says he's still finalizing the design of the pedestal on which the Perspectives will sit), but he did show off his wonderful Pulsar speakers. The Pulsars are part of the same line as the Perspectives. 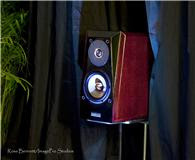 While the Perspective is a floorstanding speaker with two woofers and a tweeter, the Pulsar is the one-woofer, stand mounted version using the same drivers and the same style of enclosure. (The Perspective will retail for about $11,800, and the Pulsars are currently $7000 a pair.) While that may sound like a lot for a pair of fairly small--albeit gorgeous--"bookshelf" speakers, you'll forget about the price tag when you hear the sound. Quite frankly, the Pulsars have the best low frequency response of any small speaker I have ever heard. They sound huge! Jeff Joseph put up a black curtain behind the Pulsars, and I just had to look behind it to ensure there was no hidden subwoofer in the room. That's how big the Pulsars sound. These are really fantastic speakers in every way. Jeff was also using a sweet-looking turntable from Artemis Labs, which I didn't get to hear. That's because the real news was the digital sources Jeff was using to show off the speakers for the folks at AXPONA. The Channel D Room was my first exposure to the Pure Vinyl software package they offer, which allows you to download analog files that sound identical to music flowing from a first rate analog rig. The software even shows a graphic of a spinning LP, and the grooves are actually accurate renditions of the tracks you find on a vinyl copy. It was also my first exposure to 384 Hz downloads, which sound absolutely pristine through the high frequencies. The Channel D software even won the Computer Audio Product of the Year award from Stereophile. I spoke briefly to Rob Robinson about the Channel D services and products, and I promised him I would give the Pure Vinyl software a try. He's an extremely nice guy, and he supplied my favorite quote at Axpona while he delivered his seminar on downloading music: "We are stewards of our record collections. After we've gone, someone else will be listening to our LPs." This quote underlines the durability and desirability of vinyl LPs more than any other statement I've heard--I wish I'd said it! To read more about Joseph Audio, check out their website at www.josephaudio.com. To find out more about Channel D and Pure Vinyl, check out www.channld.com. Marc - nice meeting you at AXPONA, and thanks for the coverage! Actually, this was the Channel D exhibit room - Jeff just brought himself and his hard drive with some music. :-) The Pulsars were ours as well - we bought them from Jeff for our expo system; as was all of the rest of the equipment in the room (save for a few DACs loaned from manufacturers). Sorry, Rob! I fixed it. Hope to speak with you soon.